Treating cerebral palsy used to be something of a mystery, but new research has given kids like Bailey Jankovic a regular life. At first sight, Bailey seems like a typical 10-year-old boy. He’s energetic and lively; his love of basketball regularly sees him shooting hoops in the street with the neighbourhood kids after school. But first impressions can be deceiving. Bailey has cerebral palsy, a disorder that affects muscles and bone development and can permanently confine those who have it to a wheelchair or crutches. The fact that he can walk, run and play sport like any other boy is a testament to the advances in research that have taken place in Australia over the past decade. Bailey was born eight weeks premature in 2002. From the beginning, there were signs that he had a physical disability, but it’s severity wasn’t known. When he was diagnosed with cerebral palsy at six months old, his family was thrown into a “black hole of confusion”, recalls his mother, Michelle Jankovic. Health professionals warned that Bailey would likely need to use a walker or crutches for his entire life, as well as require numerous operations and intensive therapy. “You just want to jump ahead a decade to see if everything is going to turn out OK,” Jankovic says. 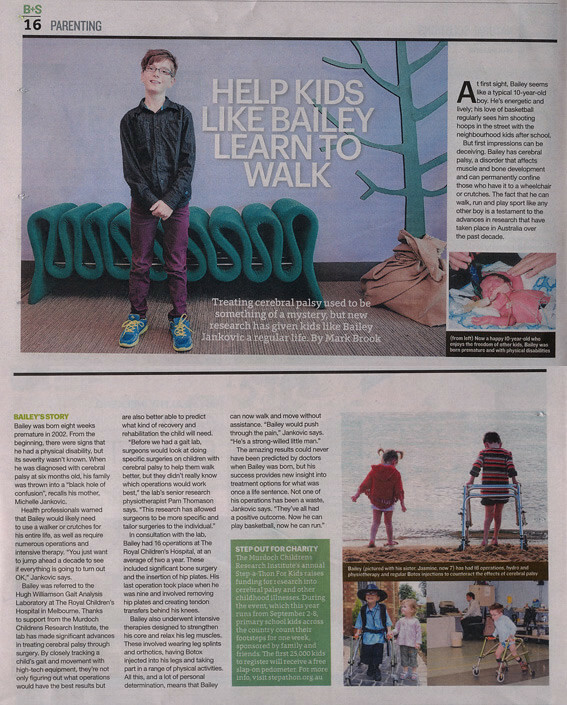 Bailey was referred to the Hugh Williamson Gait Analysis Laboratory at the Royal Children’s Hospital in Melbourne. Thanks to support from the Murdoch Children’s Research Institute, the lab has made significant advances in treating cerebral palsy through surgery. By closely tracking a child’s gait and movement with high-tech equipment, they’re not only figuring out what operations would have the best results but are also better able to predict what kind of recovery and rehabilitation the child will need. In consultation with the lab, Bailey had 16 operations at The Royal Children’s Hospital, at an average of two a year. These included significant bone surgery and the insertion of hip plates. His last operation took place when he was nine and involved removing hip plates and creating tendon transfers behind his knees. Bailey also underwent intensive therapies designed to strengthen his core and relax his leg muscles.These involved wearing leg splints and orthotics, having Botox injected into his legs and taking part in a rang of physical activities. The Murdoch Children’s Research Institute’s annual Step-a-Thon For Kids raises funding for research into cerebral palsy and other childhood illnesses. During the event, which this year runs from September 2-8, primary school kids across the country count their footsteps for one week, sponsored by family and friends. The first 25,000 kids to register will receive a free slap-on pedometer. For more info, visit stepathon.org.au.